WESTWEGO, La. 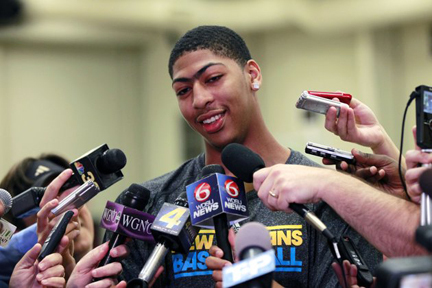 (AP) — The New Orleans Hornets officially advertised Anthony Davis’ visit as “pre-draft workout (hash)4,” even though the 6-foot-11 Kentucky star wore jeans during his tour of the club’s training center and never broke a sweat. Since winning the NBA’s draft lottery late last month, the Hornets have tried to play things close to the vest, declining to confirm publicly whom they will take with the top overall pick. That, of course, is among the worst-kept secrets in the world. The Hornets didn’t ask Davis to perform on the court during his visit, but they had him pose for pictures in a white Hornets jersey bearing the No. 23 he plans to wear next season. Those images are almost certain to make their way into marketing campaigns that the Hornets will be primed to unleash soon after Davis' addition to the squad is made official at the NBA draft on June 28. In the meantime, Davis demonstrated he can be a team-first guy, playing along with the charade as if he wasn't entirely positive he'd be the next big basketball star in the Big Easy, where he has already won and celebrated one championship at the college level. The real question, of course, is what will happen after he is drafted by the Hornets. Although general manager Dell Demps stopped short of announcing that Davis would be the first pick, he did address the matter by saying that the Hornets don’t want Davis or any rookie to join the club feeling pressure to put the team on their shoulders right away. Davis doesn’t sound worried about pressure. He’s dealt with plenty of it at Kentucky, a team that has one of the most rabid fan bases in college basketball. There, Davis played under a high-profile coach in John Calipari, and for a team that was expected to win it all the whole season and actually fulfilled that promise. The Hornets, by contrast, are working to become more relevant in a Saints-centric city. Davis arrived in New Orleans on Monday night and spent some time with coach Monty Williams, who has said in recent weeks that the Hornets plan to build around restricted free agent guard Eric Gordon, and that expectations on rookies should be measured, no matter how high they are picked. Davis talked to Williams about life in the NBA and seemed to like the coach’s philosophy. Demps saw Davis play a handful of times in person, in part because Kentucky played six times in Louisiana last season — once at LSU, three times at the SEC tournament and twice in the Final Four — en route to winning a national title. Davis led the way with his shot-blocking prowess and his ability to spread opposing defenses with his smooth mid-range jumper. Because he initially played guard, before a growth spurt, and has a relatively complete game for a big man, he is the consensus best player in the draft. The Hornets seem to like him personally, as well. “He has this great big smile on his face and he has this personality that I hope that he can stay enjoying the process, because he’s going to have enough time during the rest of his career when the pressure’s going to come and he’ll have to make big plays in big games,” Demps said. Demps didn’t want to discuss whether the Hornets saw Davis as a center or power forward in the NBA, noting that he will be interested to see how the slender 19-year-old player develops not only his skills but his body as he goes from NBA rookie to seasoned veteran. Davis’ itinerary in New Orleans included lunch with new Hornets owner Tom Benson — also the longtime owner of the NFL’s Saints — at Saints headquarters in Metairie. Team officials also planned to show Davis around the metro area. Davis apparently has a lot to learn about the city. He said he hadn’t seen much beyond Bourbon Street before this trip and that the extent of his experience with local cuisine went little beyond Popeye’s, the fried chicken chain that started in south Louisiana.